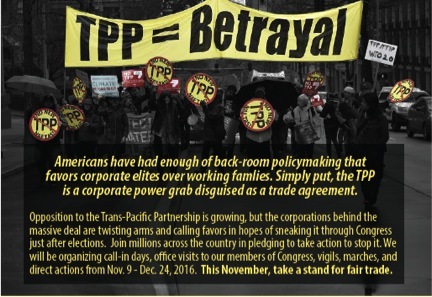 Stop a Lame Duck TPP Vote: Take the Pledge of Action! Take the Pledge of Action to Stop the TPP in Lame Duck. Americans have had enough of back-room policymaking that favors corporate elites over working families. Simply put, the TPP is a corporate power grab disguised as a trade agreement. Opposition to the Trans-Pacific Partnership is growing, but the corporations behind the massive deal are twisting arms and calling favors in hopes of sneaking it through Congress just after elections, during the “Lame Duck” session. Join millions across the country in pledging to take action to stop it. We will be organizing call-in days, office visits to our members of Congress, vigils, marches, and direct actions from November 9 – December 24, 2016. This winter, take a stand for Fair Trade!